Yesterday, I received an e-mail, it comes from one of blog readers. I read it as usual well, I love to read it, when someone talk about the food or the sweet (most of them sweet), that they make using the recipe that I posted in my blog. But this time, it's request, I have to admit that I got a lot of request, and I will do it as soon as I can if it's possible for me to make it or test the recipe at that time. Like this one, the 生チョコ (Namachoco - it means fresh chocolate), it's not hard to make at home if you have the right ingredient. And the key for success is "the chocolate". The quality of the chocolate is the most important, actually I didn't talk about the price of it, but I talk about the taste of the chocolate. Be sure to use the chocolate that you really, really love the taste of it, because most of the taste of this sweet is the chocolate itself !!! The cocoa powder is important too, it's the same as the chocolate, use the one that you can dip your finger into and eat it, haha, actually I'm not kidding. 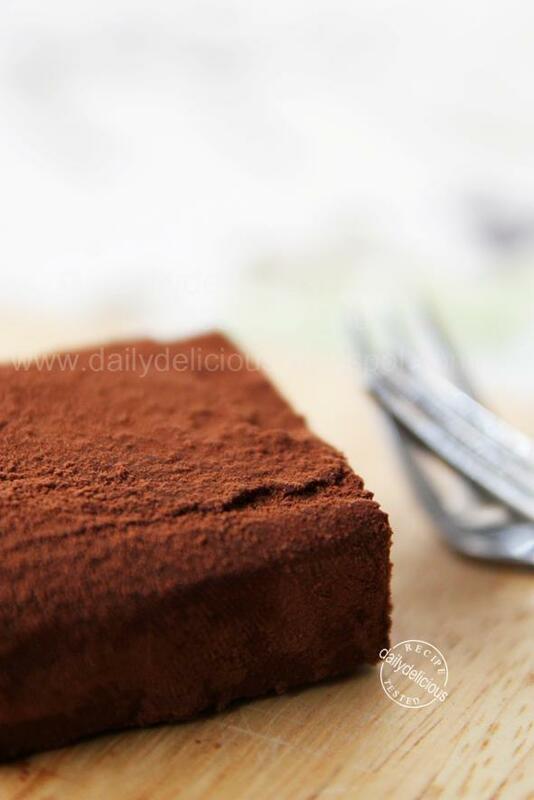 This time I use 50% cocoa mess dark chocolate, which I think it's good when you want the taste of the namachoco to be smooth, not too sweet and not too bitter (remember that you will cover it with a lot of cocoa powder). This kind of chocolate will stay soft even after refrigerate and with each bite will make you say "Ummm................" with a lot of delicious chocolate flavor. 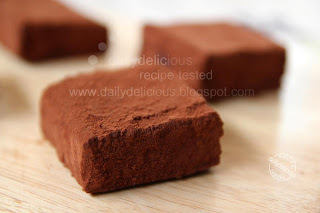 So, the key to success is the chocolate, and the most important thing in this recipe is the chocolate, so if you are a chocolate lover, grab your beloved chocolate and follow me, when you start with the right chocolate, you can't go wrong! Line 2 of small jelly molds (14.5X8.8 cm) with baking paper. Put the chocolate and butter into a medium bowl. Pour the whipping cream and glucose syrup into a saucepan, put the saucepan over medium low heat, stir until the glucose melt and the mixture boil lightly. Pour the whipping cream mixture over the chocolate, stir until smooth. Pour the batter into the prepared molds, and smooth the top, then refrigerate for 1 hour. 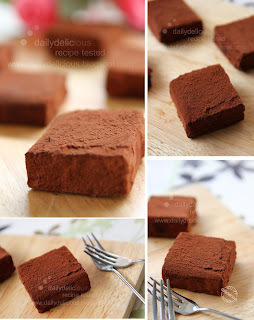 Take the chocolate out of the molds and cut into pieces. 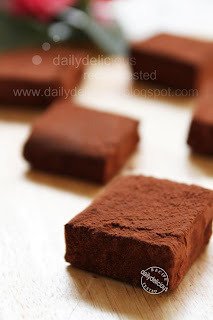 Sift the cocoa powder into a pan and place the chocolate over the cocoa powder, turn the chocolate over to coat them completely with cocoa powder. Refrigerate until ready to serve, can be kept for 2-3 days (if you can resist it, ^^). Pook, you reminding me of the nama chocolate from royce, which is my all times favourite. Yummy! I use Van Houten, it's not very bitter for me^^. is it possible for us to make a white chocolate version of this namachocolate as there are some in my family who are white chocolate lovers. There is a white chocolate version of this one, most of them will be covered with green tea powder or kinako flour. I really want to try it too, ^^. What is Glucose syrup and what brand did you use? You can use corn syrup too. You can see from the link. I haven't been blogging or baking for a long while but have been faithfully reading your delicious blog. Yesterday my mum reminded me that my 1kg packet of chocolate was about to expire. 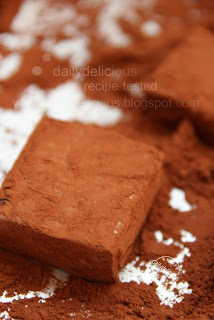 In desperation I ran to your blog and completed namachocolate and chocolate spread in one night. They were easy to make (thanks to your detailed instructions) and soooooooo good!!! Hubby was very happy and so am I. A big thanks to you. Keep this blog going!!! Thank you for your compliment, Robin. I'm happy that you enjoy them ^^. If you don't have corn syrup you can use honey, but the finished product will have a bit of honey flavor and smell. Hi, I find cutting it into nice squares a problem cos even after refrigerating it for 2hrs, it is still quite sticky. May I know how do it counter this please? You can increase the time, and when cutting it try to clean the knife after each cutting. Hi, may I kn where did u get e mould? I got it from Japan ^^. Love to bake, Love to cook and most of all collect cookbooks. Follow me into my journey through recipes testing, and have a great and delicious time everyday! Thai Version/ภาษาไทย: Just click Here. Chocolate Brownies: My deep and darkness passion!